What is a Super Ion Air Wipe? 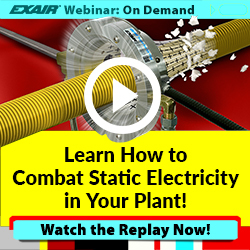 EXAIR’s GEN4 Super Ion Air Wipe provides a uniform 360° ionized airstream that is simple to clamp around a part for reducing static electricity and cleaning contaminants. It is great for use on pipe, cable, extruded shapes, hose, wire and much more. We offer the GEN4 Super Ion Air Wipe in either 2” or 4” inner diameter, it is powered by compressed air and an external power supply. The GEN4 Super Ion Air Wipe generates both positive and negative ions that are transmitted the emitter points located on the i.d. of the wipe. Since static charges can be either negative or positive it is easy to eliminate both states of charge due to the mixed polarity of ions being generated. The power supplies are available with either 2 or 4 outlets (can power up to 2 or 4 GEN4 Static Eliminators simultaneously) and are UL recognized, CE and RoHS compliant. The power supplies also have a selectable input voltage for either 115 or 230VAC. Another great feature of the GEN4 Super Ion Air Wipe is the split collar design that utilizes a clamp and hinge making it easy to clamp around the surface of the material moving through it eliminating the need for time consuming “threading”. How does the Super Ion Air Wipe work? The Super Ion Air Wipe envelopes the part passing through it with a stream of compressed air to strip contaminants and bathes it with ions to diminish any static charge. The airflow follows the surface of the material passing through it and can be effective up to 15′ (4.6m) away from where the Super Ion Air Wipe is located. The optional pressure regulator allows for fine adjustments of the air volume and velocity and the optional shim set allows for large air volume and velocity adjustments. If you would like to discuss reducing static and/or cleaning of continuous runs of materials, I would enjoy hearing from you…give me a call. Machining plastics can be a difficult task as the contact between the part and the tool generates heat, which can result in the plastics beginning to melt and stick to the tooling, causing deformities or even broken tool heads. Often times, companies will introduce a liquid based method of cooling to quench the parts during machining, while this does work, with plastics they tend to absorb some of the liquid, resulting in the finished part being outside the allowable tolerance range. Another area of concern is the mess that liquid cooling creates as now the parts need to be dried and cleaned before they can continue to the next process. Such was the case last week when I worked with an OEM who was looking for a way to cool the tooling in the machines they build for the plastics industry. The company they were selling the machines to, specifically asked for an alternative method of cooling without using any type of coolant due to the conditions mentioned above. Once again, EXAIR has the perfect solution – the Cold Gun. Incorporating a Vortex Tube, the Cold Gun produces a cold air stream at 50°F below compressed air supply temperature and provides 1,000 Btu/hr. of cooling capacity. Fitted with a magnetic base and flexible hose the unit can be mounted virtually anywhere on the machine and the cold airflow can be easily directed to provide cooling to the critical area. The system also includes a filter separator for the supply line to remove any water or contaminants, ensuring that the exiting airflow is clean and free of debris. When looking for a reliable method of cooling, whether machining plastics or other material, the cold, clean air from the Cold Gun is the ideal solution in place of messy misting systems. For help with your spot cooling needs or to discuss how using Vortex Tube technology could help in your process, give me a call, I’d be happy to help. I had an interesting application from a guy in Kuwait who worked at a plastics plant. They worked with polyethylene pellets for molding processes. In his introduction, the customer said he was looking for something like our Chip Vac product but he wanted to use it with a super sack platform that they elevate up to a high position to allow for cleaning in and around their silos. I mentioned to him that we do have the Chip Vac available to work with a 110 gallon drum. His response was that he knew about that but was not interested as they were set up to move the larger super sacks around their plant. You can see one such set-up in the above photo. His problem was that he needed a quick and easy way to get the loose PE pellets into his super sack without using a broom and shovel. We had just the solution. Many years ago when we introduced the Chip Vac product, we did so as a result of customers who knew about our Line Vac but wanted it to be used on a drum. So, we adapted the Line Vac to have the proper, 2 NPT threads necessary to screw into the larger of the two holes in the top of a typical drum. In this situation, we were working the development that we did so long ago in reverse. So, it was a very easy recommendation to set the customer up with a Line Vac to aid in the vacuuming up of the polyethylene pellets and do so in the manner the customer wanted. After a little discussion to sort out the type of material and the size Line Vac that the customer wanted, we ended up settling on a 1-1/2” Stainless Steel Line Vac Kit, model 6963. The 1-1/2” size allowed for easy connection of a standard size vacuum hose for easy manipulation around the clean-up area. The customer opted for the stainless steel over an aluminum unit as they wanted to be absolutely certain that the product could stand up to their typically rough conditions. He also wanted the kit so he could mount the Line Vac to his platform and have clean, dry air going to the Line Vac to keep it running well for a longer time. Below is a rough sketch of the customer’s idea about how to marry the Line Vac to his super sack platform. 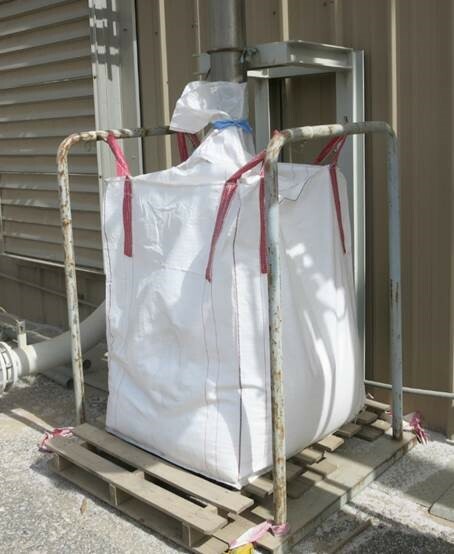 You can notice from the sketch that the customer already had his filtration system thought out to allow the conveying airflow back out of the bag. The key to this application and the feature that I want to point out is the adaptability of the Line Vac to fit into just about any application. 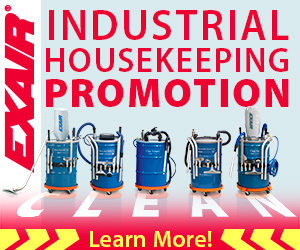 We do have the Industrial Housekeeping products available for ready to use solutions. But, if you have a similar situation where you have part of your “system” that you like for one reason or another, we’re more than willing to discuss what you have at your facility to help you best determine how we can implement a solution that you are happy with. Likewise, if we feel that there is a better way to approach your application, we will be sure to let you know that too! Give us a ring or send us an e-mail to discuss the specifics of your application today. We’re here to help.